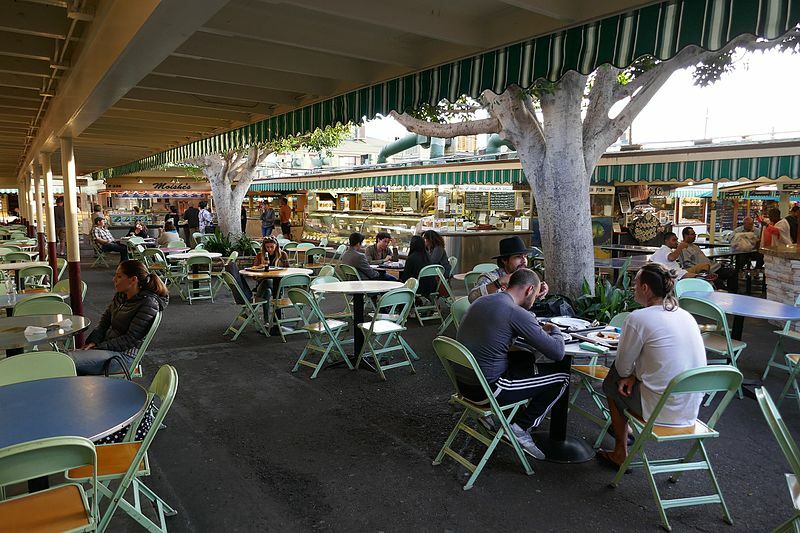 The Original Farmer's Market maintains their traditional Los Angeles roots. MELROSE—For a split second you loose focus as your eyes adjust from the bright Los Angeles sun to the shaded interior of The Original Farmers Market. Faded green and white scalloped awnings frame the close set stalls filled with glimmering fresh caught fish, golden fried doughnuts, and flour dusted bread loaves. Mint green folding chairs circle around matching tables in the center of the market. Parents pull out chairs for their young children who are elbow deep in bags of chocolates and toffees. Elderly couples sip on afternoon coffees away from the bustle of the streets right outside the sanctuary of the market. No one is rushing. The Original Farmers Market has not been overrun by the treads of the city that thrives on avocado toast, latte art, and umami everything. Instead, the vendors rely on upholding the traditions that brought them into the market in the first place. The Market began when Fred Beck and Roger Dahlhjelm of Los Angeles decided to open a “Village” on the corner of 3rd and Fairfax that would be open for farmers to sell their fresh items. In July 1934, a dozen farmers and merchants arrived, ready to sell their goods out of the back of their parked pickup trucks. By October 1934, it was clear that the Market was a success. Permanent stalls began to be installed and soon it was the favorite place for local families to shop. Today, the Original Farmers Market upholds their dedication to bringing the best quality items to their customers. With 13 grocery stalls, 34 restaurants, nine specialty food stalls, 19 shops, and 18 service stalls, the Market is not lacking in variety. Du-Par’s Pie Shop, which has a history nearly as long as the Market itself, bakes fresh pies daily, ensuring freshness. As the holidays approach, the delicately crafted pies become a staple for many family meals. Farm Boy Produce and Fresh Market Produce keep their shelves stocked with fruit that reflects the high standards of California produce. Huntington Meats and Sausages preserves the classic butcher shop feel, without skimping on quality. For the sweeter cravings, Bob’s Coffee and Doughnuts serves doughnuts all day long with an accompanying coffee in a styrofoam cup. Magee’s Kitchen, the original restaurant, keeps meals as wholesome as they were when Blanche Magee first started bringing picnics to the farmers in 1934. With the rush of the holidays quickly approaching, and the desire to make the days with family and friends unique, the Original Farmers Market serves as a stable reminder of quality and tradition. That perfect meal awaits, just under those green and white awnings. Previous articleAbu Dhabi A Place Worth Visiting!